The pool area includes: a large sunning area, two massage rooms, a full-sized, spring-water filled swimming pool, a sauna with outdoor showers, and areas for quiet enjoyment. The area is dedicated to healing and as such is designated a quiet area. 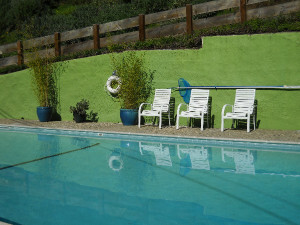 Our spring water fed pool provides a chance to cool off and float your cares away. 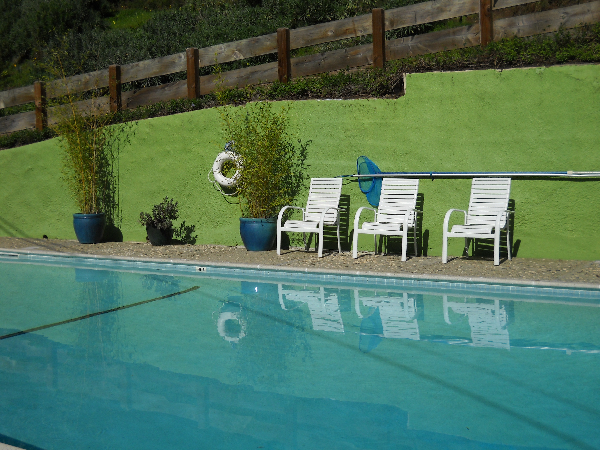 The pool is heated by a solar blanket and we surround the area with tables, lounges, umbrellas and plants to create a peaceful and warm place for rest and quiet. Our sauna is the perfect way to relax and purify before or after a massage or swim or to simply melt the cares of the day away. Time can be reserved for men/women only or co-ed use. NOTE: In the interest of all who use the sauna, we ask that no salts or essential oils be used inside the sauna. Our certified massage therapists offer a variety of healing modalities for individuals or couples. To book a massage, you may contact the Reception office by phone, email or in person. Please give us at least 24 hours to coordinate your massage.